The spine is the axial organ of our body and consists of 7 cervical vertebrae(C) from the skull downwards, 12 thoracic vertebrae(T) in the breast and lung area, 5 lumbar vertebrae(L) at the base of the spine behind the abdomen attached to the sacral bone or pelvis, and lastly the coccyx – the remnant of our prehistoric ‘tails’. 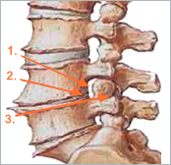 Between the vertebrae (beginning at the level C2/3) there are intervertebral cartilaginous discs. The whole static load of the body is on the spine, increasing from the skull down to the pelvis, which is why the vertebrae and the intervertebral discs also increase in size in the same direction. The normal shape is a 1½ shallow “S”. The curvature of the cervical and lumbar spine is to the front, while that of the thoracic spine is to the back. The cranio-cervical junction between head and first and second vertebra is quite different to the other parts of he spine. In these joints and vertebrae most of the motion of the head is accomplished. In the sacral and coccyx bone there are no intervertebral discs. Beginning with the 20th to 25th year of life the intervertebral discs of all human beings begin to degenerate. The primary reason is that these discs in juveniles and young adults are no longer supplied by circulation directly. The recovery of the optimum disc size can only be achieved by soaking up the necessary tissue fluid while lying down. The disc behaves like a sponge and soaks up fluid when there is minimal pressure upon it. During the day the disc loses its fluid content and so its elasticity. Collagenous tissue surrounding the disc loses its structure too and tends to tear more easily. Through these tears disc material can protrude outside and compromise the nerve root or the spinal cord. When the disc due to age or activity related degeneration, cannot soak up the necessary body fluids any longer, it looses its height and this in turn leads to increasing pressure on the intervertebral joints. This is the source of typical pain in the low back when moving. Nature tries to stabilise the situation by an additional growth of these joints to reduce pressure. This leads to foraminal and spinal stenosis. Sometime a slight vertical instability is seen too. In order to achieve the most accurate diagnosis of a patient’s spinal problems, in addition to a clinical and neurological examination, imaging of the spinal structure is absolutely essential. In most cases this means an up to date MRI or CT scan must be available. I prefer an MRI scan because it provides a very detailed picture of all the soft tissues in the brain and the spine with a usually clear indication of where there is any narrowing of the spinal canal or facet joints between the vertebrae impinging on the nerve roots. If an MRI scan is not either possible or available because of complications with pacemakers or similar objects or devices then a CT scan is acceptable. Sometimes additional neuro-physiological examinations e.g. electromyography (EMG) or evoked potentials (EP) are necessary to establish a correct diagnosis. In the final analysis and diagnosis of a patient’s condition, I will always plan and suggest the most appropriate treatment after a thorough discussion of all the findings to ensure the best possible chance of a successful outcome to any operation.